on a busy street in Frankford. 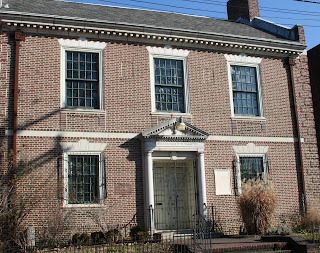 The Historical Society of Frankford is opposite the Frankford Friends school. These two venerable institutions form a vortex of learning and culture in a neighborhood rarely associated with either. We visited the Historical Society (HSF) last week and took a tour with Debbie Klak, the current president. While the HSF has no public programs during January and February, work still goes on. We met Harry Silcox, the prominent local historian, doing some research on the Edwin Forrest Home for Retired Actors and also Jack McCarthy the society’s archivist. We discussed the new organization of a Center for Northeast Philadelphia History which HSF is coordinating. A flock of volunteers came in while we were there and I could not tell you what they were doing except to say that they were very busy. The building is larger that it first appears. Using parts of 3 floors, it is filled with both documents and artifacts from the 17th century through the present day. It would takes days to do justice to a review of the exhibits but some of our favorites were related to Benjamin Franklin, the Marquis de Lafayette, Hessian soldiers during the revolution, Lydia Darragh and Frankford during the Revolutionary War, the Civil War period in Frankford and of course the Lenape indians. It was something like the Antique Road Show of Frankford. The document collection is extensive with literally thousands and books, records and maps to offer the researcher hours of new avenues to peruse. Genealogists looking for new routes to search, if your have ancestors in the Northeast, you may find that missing link right here. Every institution goes through cycles of growth and rest. The Historical Society of Frankford is moving into the 21st century in a growth mode. With the influx of new folks coming into Frankford and the increasing interest in local history throughout the Northeast, things are definitely looking up. It was a great tour for us and open house will resume for the public on the first Sunday in March at 1:00 PM. Meanwhile have a look at our slide show of some of the pictures from our tour on flickr.com.